Acai berries and pomegranate juice are great for you! You have to load up on Vitamin D! Bi-lateral symmetry is the key to mate selection across species (including humans)!Or, in order, it is a scam, taking a supplement can really mess you up, and, indeed, those of us who look less than perfect can find a great wife and produce healthy offspring. Should you drink red wine or really strong coffee (for health benefits, that is, for pure enjoyment the answer is obviously “yes”)? One year the answer seems to be “no,” the next you get a different answer. We like to pretend that our experiments define the truth for us. But that’s often not the case. Just because an idea is true doesn’t mean it can be proved. And just because an idea can be proved doesn’t mean it’s true. When the experiments are done, we still have to choose what to believe. This spins out all kinds of consequences — both positive and negative. It is not, of course, that all science is bunk (nuclear fission actually happens, for example). But I think we can be less worked up about some recent “science” on things like “The God Gene.” But we should also be hesitant to use “science” ourselves — how do you “prove” the Flood, Jesus walking on water, or the Resurrection? Do we really want to base our faith on what we “prove”? 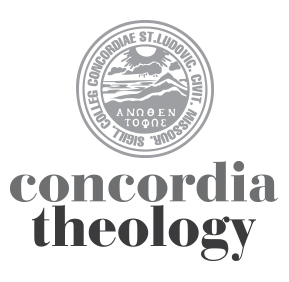 Arand and Herrmann, "Attending to the Beauty of Creation and the New Creation"
The latest Concordia Pages PDF, on finding beauty in the ordinary. Paul Raabe on how the Bible often plays second fiddle. are quite different from the Creeds and Catechisms we uphold. allegiance and judgment in my opinion, not science. One of the things I learned as a Physics major was that scientific experiments must be done blindly. With some things, this is plainly impossible as data and results are the same thing. In physics, however, enough manipulation is needed that taking raw data can happen first, and all data adjustments made before the results are figured out. The way it works is that a measurement is taken which corresponds to the measurement which you are actually looking for, but it is not that measurement. When the scientist looks at the data, then, he doesn’t see the answer he is looking for, but only random data which is meaningless. This random data is the only data which can be adjusted or cut in any way at all. Once the results come from that, you are stuck with whatever measurement you get. I hope that makes sense. Would that all “experiments” could be done in this way! It’s one of the best ways to limit (though not remove) the researcher’s expectations from affecting the results. That makes sense, Ted. Two questions follow, it seems. 1) Why isn’t all research done that way? 2) What do you do when you have observation of data before analysis (like measuring the length of bird feathers)? Are there some things we just can’t duplicate? Or do you have to hire a bunch of random people to measure bird feathers who have no idea why they’re doing it, and then hope you have a big enough sample to smooth out the outliers? Or are some things never going to be “scientific” (and that’s okay)? We learned the importance of blind experimentation, we learned it as if our professor (who has been a quantum experimentalist for 40 years) had only just learned this himself. He cited a few experiments he was a part of in the nineties which had this very problem and made claims about the Higgs Boson which turned out to be false. The conclusion I made was that this understanding of blind experimentation has only become important in the last 10-15 years for physics. One important caveat that needs mentioning: while blind experimentation prevents researchers from unintentionally biased data manipulation, it doesn’t prevent a biased experiment. Perhaps that’s an obvious point, but it is very important. Concerning your second question: I’m not sure all experiments can be blind experiments. For example, suppose a researcher wants to know the average length of bird feathers because she thinks that a certain type of bird is evolving longer feathers for climate change reasons. To get this data, she must measure the bird’s feathers, which is the information she wants to know. In this example, nothing is stopping her from explaining that some of her birds are the “wrong” types of birds just because their feathers are too short. I deleted an “as” in the first question and now the sentence doesn’t make sense. This stuff has been bothering me for a while. Science today seems to identify itself as the mechanical operation of all things without a willful operator. Therefore, all things go without God. But for the Christian or non-modernist there is a wider worldview which makes things more complicated, no? 1. Salt. This seems to be something very ‘liminal’ in terms of observing for value judgments or effects. 2. Walking on water. This seems to be something inaccessible to observation because it is miraculous. Also, only human testimony as to the event. 3. The Flood. This seems to have implications of universal observation. All cultures have stories. This event seems to imply leaving information of all kinds behind for observation. 4. Historical records. The Hebrew text as well as other historical records are attached to universal markers, astronomical reference. This makes them accessible to observation. 5. Resurrection. The implication of this is not resurrection in the future, or some ideal, but the observed event by the witnesses. 6. Spiritual phenomena. The recognition of this category demonstrates at least what lens the observer is operating with. Is it helpful to use this Aristotelian approach? Or is this getting off on the wrong foot? Mark — The gist of my little post, and Ted’s helpful (and more informed) comments is that “science” is not bad, but it is not enough, and cannot “prove” or “disprove” as much as we tend to think. I don’t know that any of the examples you cite can be “proven scientifically” — take the flood, you have rocks, pieces of wood on mountains, all of which can be debated. Heck, we don’t even know whether the “mountains of Ararat” correspond to what we now call “Mt Ararat.” That doesn’t mean it didn’t happen, it just means that we probably won’t be able to “prove” (scientifically) the event. Is there a value in trying to make the argument “scientifically” anyway? I wonder if there is, because will the argument ever be fully convincing? And even if it is, what difference, really, would it make? Will we be any more confident in the Scriptures if we “scientifically prove” the flood? Or any less confident in them if we cannot “scientifically prove” it? It is, of course, true, that no side will be able to “prove” in the empirical sense, their “story” to be THE TRUTH. We will not take the ‘faith’ out of the running. Which is exactly what we should mantra to the naturalists, evolutionists, secular humanists, transcendentalists…etc. However, that said, what would one expect in a perfect world that was destroyed by water? Billions of dead things, buried in rock layers, laid down by water, all over the earth. Interestingly, that’s exactly what we find. I’m not saying that knowing this automatically gets you to Jesus. No rational person would. However, in a world where the only continual testimony comes from evolutionized glasses on people’s eyes [ie. the worldview they were taught in our present-day Greek info-driven world and culture], the question I would pose is “Is it not worth the thinking, if it only causes just one person to step back away from their worldly worldview, thanks to our modern [those who exchanged ‘supernatural’ for ‘science’] and postmodern [those who exchanged the above plus speak against an ability to know objective truth or God] thinkers today, then isn’t it worth our utmost time? If it causes just one person to reconsider what they “thought they knew,” and see the possibility of HIStory through biblical glasses, rather than just turning a blind eye to what our culture has lifted up for nearly 500 years [empiricism], would that not be worth our minute efforts here on this planet, for His glory? I’m not a regular contributor, I appreciate the invitation and the article, but I more appreciate all that you men are doing to proclaim salvation in Jesus to all people, and to ward off the working and deceptions of satan and our sinful flesh. May Jesus bless you in doing just that, to His glory. And so our trust in science is misguided– I guess if it an absolute trust, no? But are we not invited by our norming testimony to observe? God “said” and then he “saw” that creation was good, no? Our Scriptures have the quality throughout them– something that most other holy books do not have– that they are accessible through observation, they are not merely dogmatic texts but testimony of human observers. You ask: can we make people more confident in the scriptures either way? First off– isn’t that why we scholars like yourself? To make us confident in the testimony we have? I now see what Forde was saying in an article he wrote: we do not have an a priori statement from our norming scriptures about the scriptures themselves; they just are what they are. And yet we have Christians everywhere treating the 66 or 77 books as guaranteed documents; but we don’t have such a guarantee anywhere. Only one implied by our propositional view of God and God’s word. Thanks for tracking along with this, Mark. Good discussion. I guess we are “in a real bind” — if you submit the Scriptures to the need for an “a priori” foundation (by which I think you mean, one that everyone — Christian or non-Christian — will agree to). In Christ, of course, the “veil is removed,” and we see the Word for what it is. Couple thoughts: I guess I don’t really see my task so much as “to make us more confident in what we have” as it is to keep pointing to the Word, encourage us to let it be what it is (with all its–from our perspective–messiness), and then get out of the way. Second thought: Take a read through Isaiah 28, in the Hebrew if you can (the sarcasm is more evident in the Hebrew) with a good commentary. Vv 9-10 mocks Ephraim/Judah as if they were drunken teachers, repeating God’s Word as if it were mere rote lessons for little children. Vv 11-12 replies that the message was indeed God’s Word, unheard, but the Word nonetheless. Then in 13 the sarcasm comes in, and the result at the end of the verse is judgment for ignoring the message (14-15). 16 is God’s reply: a stone is laid in Zion, a cornerstone, a foundation. With this foundation (the NT makes the obvious move here to Christ) “I will establish justice as a line, and righteousness as a plummet.” There’s your foundation. No spoons for gouging out the eyes are necessary. Thanks for saving my eyes– I need them to drive. Before I get to that one, one of our congregation members claimed that “logos” really meant “narrative.” Can you confirm this? If this is the case, then John is saying that Jesus is the “whole narrative.” I then go further and say that we, the Church, then see Jesus in the “whole narrative,” which is normed by the Scriptures (OT + NT) and we can extrapolate to all of Creation and world history– we believe that Jesus is the narrative, i.e. the Word. John is saying Jesus is the whole thing, in and beyond our texts. Allow me to drop another reference here: Hank Hanegraf on the radio likes to say this proposition: “The Bible is fully human and fully divine,” making the transference from what I believe is our language for the two Natures. But what is the impetus for making this move? Why is there a need to put our Scriptures co-equal with Christ? What does this have to do with Science? You said that Christ is our foundation, we sing this, yes! But do we really believe this? Why do we treat the Bible as the real foundation if we say Christ is? (I am not saying the Bible is crap, don’t get me wrong.) Why keep acting as though the Bible is co-equal with God? You know that it has been in human hands. You know that Paul and the Apostles were using the LXX which was changed in at least some numerical aspects of lists– the Jewish translators probably did this on purpose to hide some secrets from the Gentiles. What if we had a situation in which the Scriptures, science and Jesus were all subject to each other in some sort of M.C. Escher recursiveness? Then we have a situation in which each side accuses each other of using something as foundational which is ‘out of bounds.’ But they are set in a way that there is no foundation, and they testify to the God of Jesus.